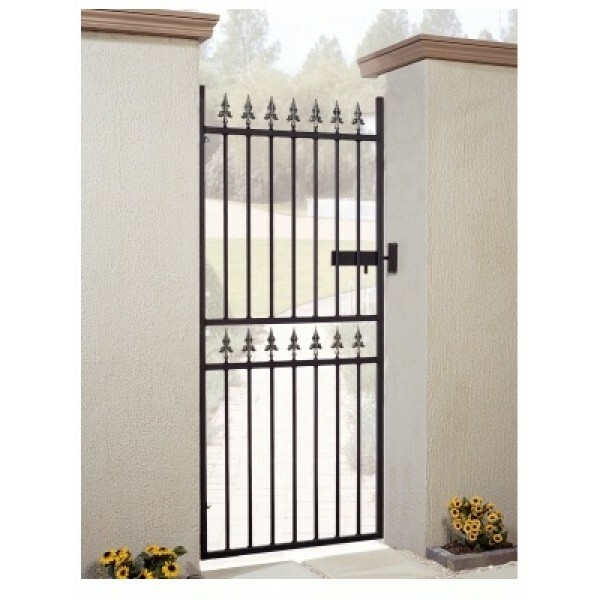 The Corfe Tall Single Gate is made from the finest materials to ensure the very best quality. This high quality gate has solid steel infill box and chunky hollow box frames giving it a traditional heavyweight look with an authentic wrought iron appearance. The elegant design will compliment the most stately building. The gate can be padlocked for security. If our standard sizes won't fit, a made to measure service is available for this gate. For the width, measure the gap you have between your walls or posts. If you are replacing an existing gate, do not measure the gate itself as this will not take into account the space for the hinges and latch that are supplied with your gate. For example, if the measurement between your walls is 3ft. You should order the 3ft gate. If you also require posts, the space taken by the posts will be in additional to the gap required for the gate, so a 3ft gate and 2 x 3in posts will require a total opening of 3ft 6in. The height measurement of the gate is from the bottom frame to the highest point in the gate. When installing your gate, remember to allow for ground clearance, typically 50mm (2") or more if your ground slopes. Fittings. 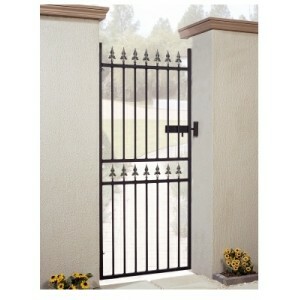 The Corfe Tall Single Gate is supplied with hinges, latch and latch keep. Please note that the hinges and latch keep require a flat vertical surface for installation. Opening Direction. The Corfe Tall Single Gate is designed to be hinged on the left side as you look toward the house from the road and opening with your right hand, swinging away from the road. Square Steel Posts. If you are installing directly onto brickwork, due to the weight of the gates, care should be taken to ensure the brickwork is strong enough to support them. Steel posts which are concreted into the ground are recommended to avoid damage to brickwork. Finish. The Corfe Tall Single Gate is supplied dipped in a black primer ready for you to paint with a top coat in the colour of your choice. We recommend Hammerite but any exterior metal paint can be applied. Delivery Times: Made to order. Delivered in approximately 2 weeks.